How Often Should I Clean My Dentures ? It is important to treat your dentures as you should treat your natural teeth. They must be kept as clean as possible to prevent inflamed gums, bacterial and fungal infections or further tooth loss. What Is The Best Way To Clean My Dentures ? The general rule is to rely on a soaking solution and brush only when necessary and only with a specially designed soft denture toothbrush and denture toothpaste. 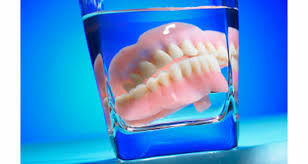 Always clean your dentures over a bowl of water or a folded towel in case you drop them. Rinse your dentures thoroughly before soaking, to help remove any food debris. Using an effervescent (fizzy) denture cleaner will help remove stubborn stains and leave your denture feeling fresher. Always follow the manufacturer`s instructions. 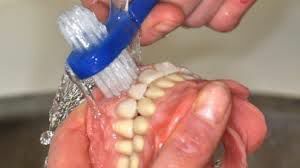 If you need to brush your dentures, be careful not to scrub too hard as this may cause grooves in the surface which can cause stains or plaque to build up. 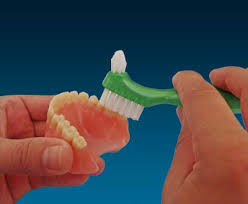 Make sure you clean all the surfaces of the dentures, including the surface which touches your gums. This is especially important if you use any kind of denture adhesive. 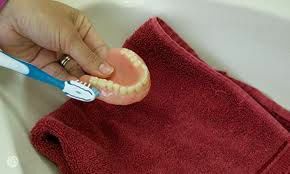 Do NOT clean your dentures with normal tooth paste. Which Cleaner Should I Use ? There are many different denture cleaning products available direct from your Dental Prosthetist or at most grocery stores or chemists. Your Dental Prosthetist recommends use of an effective denture cleanser solution, such as denture tooth paste. Look for one that contains active ingredients to break down the plaque, removing the debris, as opposed to some cleaners that merely bleach the stains without removing them. always ensure you follow the manufacture`s instructions. Which Should I Avoid ? It is important not to use any type of bleaching product, ammonia based cleaners, abrasives or very hot water to clean your dentures. Bleaching can lead to weakening of the denture and will damage its appearance. The use of ammonias or abrasives will remove the glossy surface allowing stains to bold up, whilst very hot water can distort your denture, affecting the fit. How Do I Care For Soft Lining ? People who have sensitive gums may have a resilient softer lining made for there dentures. If you have one of these special linings, your Dental Prosthetist will provide individual after care advice to make sure you are aware of what cleaning products or fixatives you can use. How Do I Care For A Metal Denture ? Some commercial cleaning products can damage metal dentures. Most cleaning products have warnings on them, but never use bleach or milton solution. If you have a metal denture, it is important to discuss cleaning options with your Dental Prosthetist. If your acrylic denture has metal clasps, you need to take particular care when cleaning. Should I Remove My Dentures At Night ? Your Dental Prosthetist recommends removing your dentures at least twice a day to allow massaging of the gums, encouraging adequate blood flow to that tissue. However, we appreciate that you may not wish to leave your dentures out for extended periods, so during your cleaning routine simply brush the gums with a soft toothbrush. If you do remove your dentures overnight, your Dental Prosthetist suggests that you leave them in water to prevent any warping cracking. Discuss this issue with your Dental Dental prosthetist. My Dentures Are Stained What Do I Do ? Like natural teeth, dentures are vulnerable to staining by everyday habits. This is especially true if you smoke or drink a lot of tea, coffee or red wine. In most cases you should be able to remove this staining with regular cleaning. More stubborn stains may take a little more cleaning, and your Dental Prosthetist is happy to provide advice for you. Apart from the daily cleaning of your denture, it is important to have your mouth and dentures checked every year to review their functionality, cleanliness and fit. During a consultation, your Dental Prosthetist will provide you with a detailed assessment of your dentures, the supporting tissue and detailed quotation for any necessary service such as cleaning and high polishing of your dentures. Regular Maintenance and check ups not only ensure the health of your mouth and gums, they also may help prolong the life of your denture. Now that you are a denture wearer, Will and his team are your first dental choice team and will share the responsibility for the health and function of your denture with you. Call (02) 9610-1030 to book an appointment.